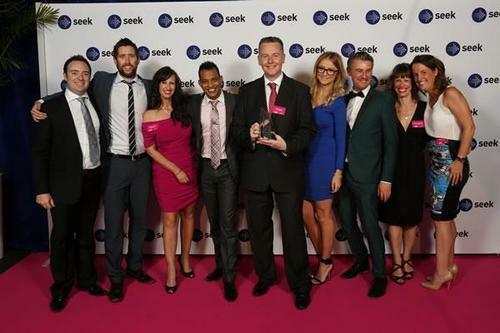 The 2014 Seek Sara Awards were held at Sydney’s Museum of Contemporary Art, and the night was certainly one to remember. For a second year running, Ensure Recruitment was delighted to be announced - among an illustrious group of peers - as finalists within the Recruitment Agency of the Year – Small. These awards are held in high esteem throughout the Australia’s recruitment community, as they are a key measure of excellence, and the provision of superior service and specialist knowledge across the industry. Since 2002, the SEEK Annual Recruitment Awards have celebrated the best recruiters in the industry as judged by the nation’s jobseekers. Following consultation with the RCSA (recruitment’s industry body), clients and key industry stakeholders, SEEK decide to change the criteria and this year entrants were based on submissions, which were to be reviewed by a panel of esteemed professionals from the recruitment, professional services and education sectors. Ensure Recruitment is exceptionally proud to have been named finalists and congratulate all those who participated. In line with this achievement, we will continue on our commitment to deliver exceptional service to our clients and candidates across the Insurance and Superannuation sector, and look forward to continuing our strong relationship with the industry. Ensure has consistently received exceptional feedback from the candidates we represent and so this year we decided to enter the Seek SARA awards for the first time. The Seek SARA awards are the industries highest accolade for recruitment companies as they are totally independent and winning is 100% dependent on our candidates taking time out of their busy day to vote for us. On the awards night we were delighted to win the BEST Boutique Specialist Agency in Australia. Winning this award is not something we take lightly and we are exceptionally proud that the hard work we put into representing the very best talent in our industry has been recognised by our candidates. We thank everyone that took the time to vote for us and very much look forward to your support for next year when we again will be entering to win this prestigious award. Many of our senior consultants have become trusted advisors to our candidates in their career options, choices and goals. As market leaders we are in a prime position to provide tailored advice on career choices and we offer our professional opinions, guidance and experience to ensure our candidates are making well informed decisions even in situations where we are not directly representing them. As such the Ensure Brand and consulting team has career conversations with over 2,000 experienced industry professionals each year.